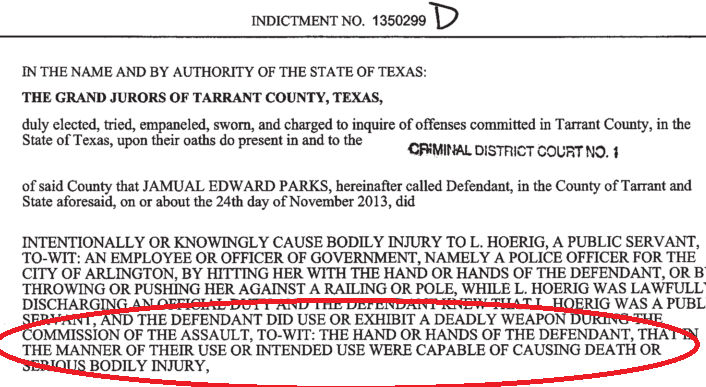 Update – I have obtained a copy of the official Indictment and Judgement and Conviction by Court and these documents do indeed show that State of Texas was satisfied that Jamual Parks hands, given his MMA training, were a deadly weapon. It is reported that authorities Tarrant County, Texas recently charged a man with MMA training with assault with a deadly weapon. The deadly weapon in question escalating the charge to aggravated assault? His hands. The Defendant, Jamual Edward Parks, reportedly plead guilty to the charge and was sentenced to six years in prison. Arguably trained hands can meet the broad definition under sub-paragraph B but I suspect a Court would have little difficulty in ruling that hands are not a “thing” which presumably references an external device of some kind. In Ray v. State, 160 Tex.Crim. R., 266 S.W.2d 124 (1954), a murder case, the court held that hands and feet, which defendant, according to the indictment, used in killing the deceased, were not “deadly weapons” per se and they could become such only in the manner used. Likewise in the instant case, and under the 1974 Penal Code, we conclude that a fist or hand are not “deadly weapons” per se but can become such only in the manner used depending upon the evidence shown.